Stockfisch produced on the Norwegian coast north of Bergen became its main export particularly to Catholic and Orthodox countries who needed dried fish for fast days. Tayside ships brought much wood from Bergen in the 16th century. Bergen had traded with Lübeck since 1161 and, as a result, a Hanseatic Kontor was established in 1360. The Germans succeeded in excluding foreign merchants, and so controlled Norway's trade. The Kontor was to the east of the harbour. The Hanse treated Bergen inhabitants with contempt turning the district (the Tydskebrüggen [German bridge]) into a stronghold with its own laws. In 1455 Hanseatics killed the governor, bishop and 60 others. Between 600 and 3000 German merchants lived in the Kontor until its power began to decline after the Hansa lost its monopoly position in the North in 1536. This was as a result of defeat in a war against the Swedes and the Danish nobility. 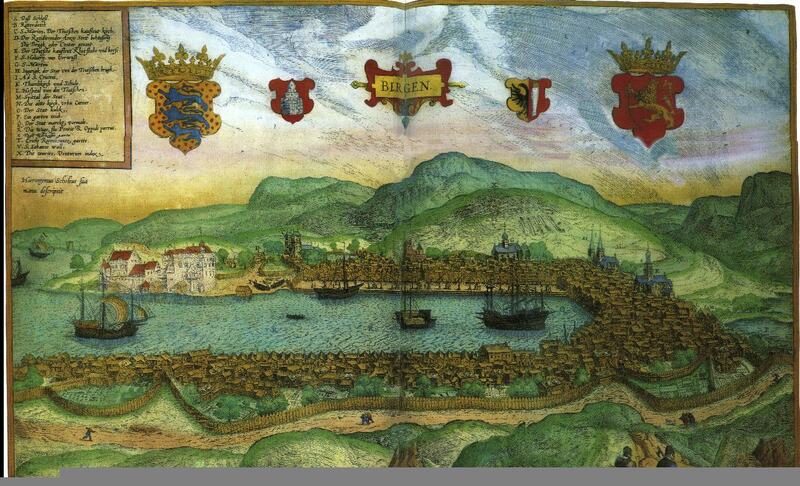 Search for voyages to Bergen in the 16th century.